Walton Hugh Goldsby, also known as Walter Goldsby,born December 31st, 1861 in Marion, LA was a professional baseball player from 1884-1892, professional baseball manager, and a professional baseball umpire. He resided in multiple Arkansas cities during his life, including Missouri (Nevada County), Pine Bluff and Harrisburg. At a time when most baseball players were from urban cities, Walt Goldsby was a rare product of the rural south. 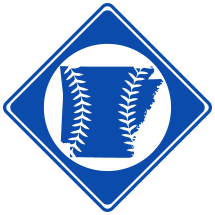 In fact, he was the first Louisiana native not from New Orleans to play in the major leagues, and was perhaps the first professional baseball player with Arkansas ties. He was born in the Confederate succession state of Louisiana during the Civil War in the small town of Marion near the Arkansas-Louisiana border. His parents, Dr. Miles Walton Goldsby Jr. and Irish immigrant Dettie Dudgeon1, were a young couple, and Walt was their first child. The family, however, was soon broken up by the war when Miles enlisted in the Confederate Army, leaving Dettie and an infant Walt2. An educated man with a medical degree from University of Louisiana3, Miles served as an assistant surgeon4 until he was killed in 18655. The loss left Walt without having ever really known his father, and only Dettie to care for him and a second son, Thomas Boykin6. A bright, capable woman, however, Walt’s mother managed to support the family by working as a postmaster at a nearby rural office7. A teacher by trade8, Dettie soon took a job at a school across the border in Lapile, AR9. By 1880, she moved the family to Nevada County, AR6, and a year later, married the prominent southern Baptist minister Marshall Daniel Early10 11. By this time, however, Walt was a young adult, and he soon left home and went to St. Louis to work in the offices of the Missouri Pacific Railroad12. While St. Louis in 1882, Walt began playing baseball with the Missouri Pacific Railroad team13. He played with Evansville in 1883 and part of 1884 before catching on with the St. Louis Browns of the American Association. The team was managed by Hall of Fame great Charles Comiskey, and Goldsby soon became manager of the reserve squad. By December, 1883, Goldsby had signed with St. Louis of the American Association 14. In the 1900 census, Walton was living with his brother in Pine Bluff, AR 18. At the time of Goldsby's death, his residence was reported to be Harrisburg, AR 19. "MAN IS FOUND DEAD IN ROOM IN HOTEL"
"Funeral of W. H. Goldsby"
"A Once Noted Major League Player and Minor League Manager of Ability Ends Life By His Own Hand." 9. Lapile: A Pioneer Community, by Mrs. Robert Vaughn Montague Cordell, Arkansas Historical Quarterly 6 (Winter 1947): 275-85.